The perfect Electronic Accessories Organizer Case for your active lifestyle! We want to make it easy for you to store and keep your important electronic gadgets and accessories safe whenever you go. The sizeable organizer opens up to a double layer interior with a plethora of elastic bands, mesh pockets, large flat pocket and zippered pockets, giving you space for mini tablet, electronic cords, memory cards, small gadgets, earbuds, travel documents and whatever else you need neatly put away. It also has a waterproof exterior, keeping your electronic gadgets safe from spills and bad weather. Versatile electronic accessories organizer specifically designed for well-organized people; multiple pockets and slots of various sizes provide great flexibility for organizing your electronic gadgets and accessories. Our electronic accessories organizer case is carefully designed to be the easy practical solution to store all your electronic gadgets and accessories. The size of the case is compact and portable, easy to take anywhere and fits in any bag or travel case. Stylish creation with attractive, durable waterproof nylon with double layer provides added discretion and makes a fashion statement. 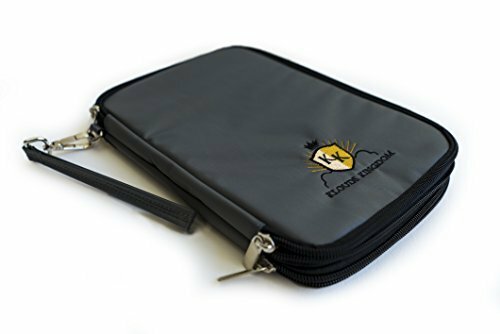 Have the practical, durable, portable, and stylish Electronic Accessories Organizer Case and keep your important gadgets and accessories in reach with this product by Klouds Kingdom. Click ‘Add to Cart’ right now and order yours today! ✔️ Durable Material For Ultimate Protection: Electronic accessories case is made of heavy-duty, durable and water repellent nylon with double layer, design to protects your electronic gadgets and accessories from spills and scratches. The size is: [Outer] 10" x 6.8" x 1". [Inner] 9.5" x 6.3" x 1". ✔️ First Layered Compartment: The first layered compartment has 1 large elastic topped mesh pocket. It is a good size for storing a power bank or an average size phone and charger. On the other side is a larger flat pocket attached to a neoprene sleeve with the velcro flap closure. The large pocket size compartment offers extra protection for tablets up to 7.9" in size such as ipad mini, kindle or even important documents such as passport, travel money, etc. ✔️ Second Layered Compartment: The second layered compartment offers 3 elastic slots and one mesh pocket. The zippered mesh pocket is perfect to keep the compact hard drive, usb or card readers. And there is a small pocket for storing your SIM, TF and SD card. Across from that there are 5 elastic slots ideal to safely strap down countless cords from becoming a jumbled mess, and also allow you to keep a small device as the middle slot allow bigger room. ✔️ Creative and Compact Design: The convenient of double zipper of the sleeve pouch provides a quick access to your organized gadgets and accessories. The stylish logo helps you differentiate from different bags and the compact design is perfect for travel and can be packed easily inside your backpack, shoulder bag or suitcase. If you have any questions about this product by Klouds Kingdom, contact us by completing and submitting the form below. If you are looking for a specif part number, please include it with your message.